Kota Kinabalu, Malaysia 7 May 2016 - Shangri-La’s Rasa Ria Resort & Spa, Kota Kinabalu launched “Big Hole Golf” on 5 May 2016 at the resort’s award-winning Dalit Bay Golf & Country Club with 33 invited players to enjoy a fun 9-hole game. The event was kicked off by the president of Sabah Golf Association Datuk George Bandusena and general manager of Shangri-La’s Rasa Ria Resort & Spa Jonathan Reynolds. Keeping abreast with current trends, Dalit Bay Golf & Country club showcased its new initiative to the club members, corporate clients, travel partners and meeting organisers during the event. “I am excited to announce that Dalit Bay Golf & Country Club is the first golf course in Borneo to have Big Hole Golf, leading the golf trend in Sabah, the club offers a new style of play for both advanced and new players a fun and exciting experience,” said Jonathan Reynolds, general manager. The main difference between Big Hole Golf and the traditional golf is the cup size of the hole, 6 inches compared with 4.25inches, another rule that breaks the tradition is to have the flagstick remaining in the hole, making it a fast paced format of the game. Dalit Bay Golf & Country Club will offer Big Hole Golf as an added option for golf tournaments for those wanting something different by mixing Big Holes with normal holes. The regular sized cup remains at the 18-hole championship golf course, Big Hole Golf is only available on request and during the monthly Big Hole Golf day on 1st Thursday of every calendar month, the first Big Hole Golf Day at Dalit Bay Golf & Country Club will commence on 2 June 2016. Dalit Bay Golf & Country Club, an 18-hole, Par 72 championship course designed by golfing architect Ted Parslow. Traversing between the Tambalang and Mengkabong rivers and set amidst the stunning tropical jungle and wetlands. 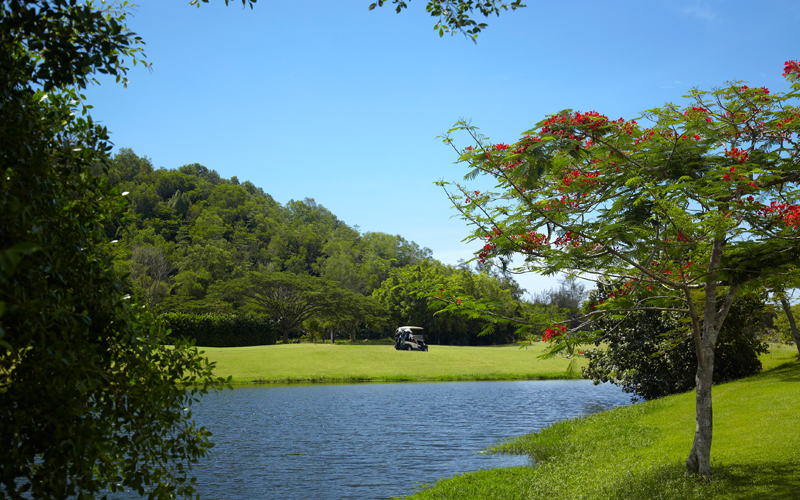 Beautifully manicured Tifway grass fairways and Tifdwarf greens glide through this natural landscape, with stunning views of the South China Sea and Mount Kinabalu providing the inspiration for golfers of all abilities on this challenging course. Dalit Bay’s clubhouse has all the amenities golfers look for. Among them, an aquatic driving range with 15-bays, chipping area, practice green, pro-shop, Golfers’ Terrace, multi-purpose private function room and The Spa. Adjacent is the 5-Star Shangri-La’s Rasa Ria Resort & Spa that houses several restaurants, a fitness centre, a wide menu of recreational activities and the 64-acre Nature Reserve. For inquiries, please contact the Proshop, Dalit Bay Golf & Country Club at telephone 6088 791 188 / 333 / 666 or email to dalitbaygolf.rrr@shangri-la.com. Please log in to www.dalitbaygolf.com.my.